A date for your diary. The weekend 20-21 April 2013. Our initial thoughts are to have a themed AZW in Brecon over that weekend in the Regimental Museum of The Royal Welsh in Brecon. On the Saturday (20th April) at 0930 we'll be at Llantarum Church (near Cwmbran) for the official unveiling of the new headstone for John williams VC. On Saturday afternoon - the 1879 Group will populate the Museum to enhance our AZW display. 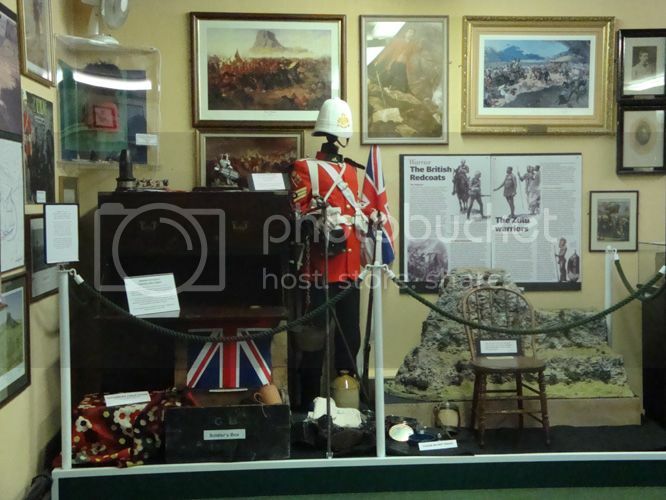 We've re-done the layout of the room with some new cabinets and a 48 square foot model of Rorke's Drift. Saturday evening - the customary curry ! On the Sunday at about 10am Dr Jay Pinto will be showing the black and white documentary "The Making of Zulu". This was a film made in 1964 to help publicise the main film, though it never got finished or shown at the time. There are some amazing bits showing the construction of the set, the training of the extras, and some pieces deleted from the final production copy of the film. This will be a rare opportunity to see this unique film. No booking - and the normal £4 entry fee will apply. More details will appear as we tie up the loose ends. Excellent news Bill - I will definitely be there on the Sunday. I saw this film when Jay presented it at Bristol in 2002. He said that if he could establish copyright he would then make copies for sale. Do you know if he will be selling copies at Brecon? I have asked him and the answer is "no". However, I will keep on asking - maybe suggesting an exclusive outlet through the Museum ?? !!!! Just flagging this up and hoping to see old friends/new faces on the Sunday. Can't make Sat but I'll see you Sunday. At 0930hrs the 1879 Group will be at LLantarnum Church (near Cwmbran) for the ceremony to unveil a new headstone over the grave of John Williams VC. Following that, the Group will be present in the Regimental Museum in Brecon (from about mid-day). At 10.30 Dr Jay Pinto will be showing the black and white documentary "The Making of Zulu", followed by a 16mm 5 reel edition of "Zulu" itself. The 1879 Group will be present for most of the day in the Museum. Admission to the Museum will be £5 per day, with no extra charges for viewing the films. Hoping to be there for both days, Bill. An enjoyable day. Dr Jay Pinto had travelled from Hull with his son to explain and show the film of parts of the build up and making of Zulu. If he hadn't rescued it in 1999, I'm sure no one would know it existed. Many thanks to them and to Bill for hosting it. The museum is looking good with the renovations which he has done. We're hoping for a full blown event in 2014, so prepare. I would like to echo Alan's thanks to the Dr Pinto and to Bill for organising and hosting the event. Despite having read Sheldon's invaluable book (memo to self - time to read it again) I had forgotten the challenges involved in making films in South Africa in the 1960s. The film was made - quite literally - under the guns of the military, and the political pressures involved should not be underestimated. A white vicar in South Africa opens his church door to see a Zulu on his hands and knees. "What do you think you are doing?" demands the vicar. The vicar thinks for a moment. "Carry on - but don't let me catch you praying." But equally some things have not changed. I was delighted to be reminded of the Indian Market where I bought a verdite head of a Zulu in 2002. That place alone is a reason to visit Durban. It was my first visit to the revamped AZW display at Brecon and it really is magnificent. The room appears larger, the artefacts captioned and presented well and history does come alive. I really enjoyed meeting up with old friends and it would be wonderful if days like this could generate more support. I came away with the centenary tie on sale (OK, 34 years too late and I'm not sure polyester was fashionable even then) which I will wear with pride at the first opportunity. Brecon is not as far as it seems - visitors to the museum will not be disappointed. Yes, indeed, a good day out. Thanks to Dr. Jay Pinto for making the journey down from Hull to show the films. A lot of effort (and expense) has been put into the revamped (and improved) Zulu War room. Good to meet up with old friends again. Thanks Bill for the "blue note" experience. Now, did you know that the trees which line the road outside the Barracks to the old railway station were planted to commemerate the regiment and there are exactly 24? Two of the trees are much younger than the rest because some years ago two were cut down in ignorance by some council worker. Local public "reaction" ensured they were quickly replaced. Not a lot of people outside of Brecon know that!